To date, no study has empirically examined the relationship between the full range of landscape features such as landform (e.g., mountains, lakes, hills, rivers) and land cover (e.g., agriculture, indigenous vegetation, urban) with perceptual values that humans associate with landscapes at a regional or national scale. 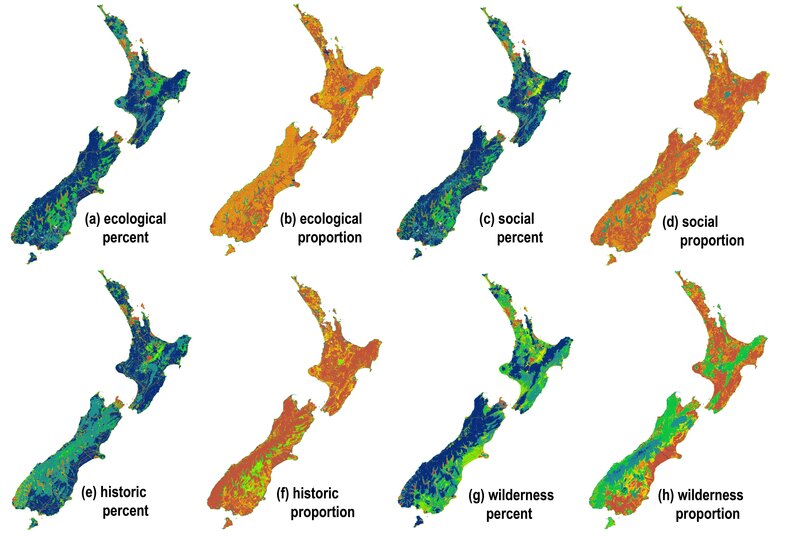 We spatially intersected eight landscape values collected through a regional public participation GIS (PPGIS) process in New Zealand with physical landscape features from the New Zealand Land Classification (NZLC) system. We identified significant spatial associations between perceived landscape values and features and describe these relationships in this article. For example, greater than expected landscape values were associated with urban areas, water features, indigenous landcover, and mountains. Fewer than expected landscape values were associated with flatter, agricultural landscapes. We used these landscape value/feature relationships to extrapolate social landscape values to the entire country of New Zealand. 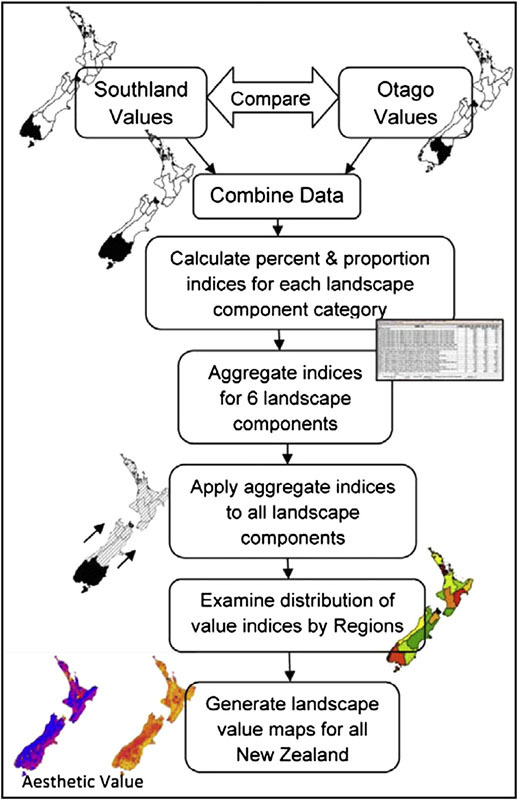 We used two quantitative approaches for extrapolating the landscape values: 1) landscape component weights based on the percentage of value counts found within landscape components from the New Zealand Land Classification (NZLC) system, and (2) landscape component weights based on the ratio of landscape values to the landscape area. You can read about the process of value extrapolation or "value-transfer" as others have called it (Sherrouse, Clement, and Semmens, 2011) in this article. 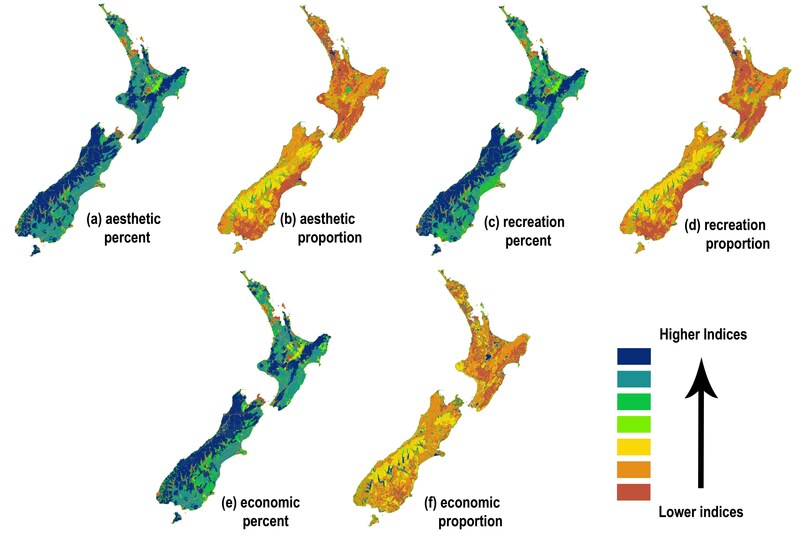 We generated maps of seven landscape values for the entire country of New Zealand to demonstrate the extrapolation method. You can view the New Zealand map images for aesthetic, recreation, and economic landscape values here. You can view NZ map images for ecological, social, historic, and wilderness value here. So what do these maps show? 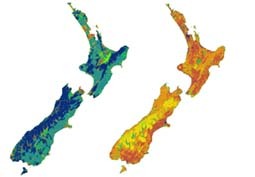 If the extrapolation (value-transfer) process is valid, these maps show the probable location of the highest/lowest concentratiosns of various landscape values in New Zealand. For more information about these studies or the landscape extrapolation method, contact Greg Brown.